Empirical research conducted in the laboratory, in the clinic or in the field naturally forms the foundations on which our practical applications of psychology are built. Yet as theoretical frameworks change over time, as new communities of practice evolve, and as the reservoir of empirical findings becomes increasingly vast, connections between past research and current practice can all too easily get lost. Since its formation in 1944, the MRC Applied Psychology Unit in Cambridge has played a major part in shaping both theory and practice. Its innovative and creative research culture is illustrated here by three examples from wartime to the present. Experiments in psychology really do matter. They are not just a force for developing better and better theories of mind, brain and behaviour. Their results can influence the conduct of war, as well as what goes on in the home, schools, government, our legal system, the workplace, transport systems and decisions made in clinical settings. Just occasionally they may change how we think about our selves, our emotions and our conscious lives. The Medical Research Council’s Applied Psychology Research Unit (APU), renamed the Cognition and Brain Sciences Unit in 1998 (CBU), has been a powerhouse of ideas and of results. Over seven decades and under six directors, its output is reported in over 6000 publications and these have touched on all the topics noted above and more. I recently read through the periodic reports to MRC from the 1940s to the present. How on earth could I possibly select a handful of examples of empirical excellence that today’s psychologists should know about, without omission and bias with respect to topic or time period? What would the selection criteria be? The earliest work of the Unit contributed to the war effort, influencing personnel selection, operational procedures, equipment and workplace design. From the film The Battle of Britain many will have seen the control rooms used to direct the air defence of England: controllers looked down on symbols being moved over a map to indicate the disposition of hostile and friendly aircraft (Figure 1). Not so many are perhaps aware that experiments on aspects of this layout were carried out by APU staff but only published years later (Mackworth & Bartlett, 1950). How might that work, integral to national survival, but cited a mere 11 times in Google Scholar, compare with recent and more esoteric work on emotional Stroop effects cited close to a thousand times? The blend afforded by producing both high-quality science and applicable output is held by many to be what gave the Unit something close to a uniquely creative and productive research culture: the demands of producing practical recommendations in new contexts inevitably exposes gaps in prior knowledge, creates needs to innovate in measurement and sets requirements to chart the boundaries of any new regularities of behaviour. New regularities, in turn, need new theories to account for them. Most would agree that classic theoretical syntheses by APU staff, for example, in books by Broadbent (Perception and Communication, 1958); Baddeley (Working Memory, 1986) and Shallice (From Neuropsychology to Mental Structure, 1988), each acted to shape how whole generations of scientists thought about human attention, memory and the wider control of cognitive processing. Indeed one recent book tracing the entire history of experimental psychology from James and Wundt to cognitive science (Mandler, 2007) draws attention to their ideas along with those of a significant number of other APU researchers. The current CBU website (www.mrc-cbu.cam.ac.uk/history) provides an illustrated archive summarising all the basic and applied science topics researched at APU/CBU from 1944 to 2010. To mark this celebration of 150 years of experimental psychology, I will focus, not on the high-profile ‘director-theorists’, or on summarising work in different decades, but on three specific empirical studies that either have provided (or will provide) long-term impetus for developments in both theory and application. For an empirical discipline, psychology has rather few laws – itself a topic of some interest to historians of psychology (Teigen, 2002). APU can claim parentage of one: Hick’s law. By 1950 a great deal was known about reaction times and the possible contributions of cognition time and choice time. What William Edmund Hick realised was that the key required to capture a lawful quantitative regularity lay in information theory – he hypothesised that reaction time would increase with the logarithm of the number of alternatives, or the amount of information to be processed. 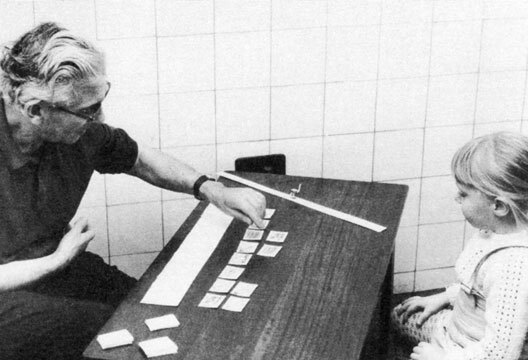 Using apparatus shown in Figure 2, he confirmed his hypothesis in a series of experiments that involved collecting data from just two participants (himself and Richard Gregory). The average reaction time T required to choose among n equally probable alternatives is approximately T = b – log2(n + 1). At the end of his classic paper Hick (1952) rather ruefully concluded that, while his information theory statement might be useful for practical applications, the details of the mechanism remained vague and that speculation about neural networks was outside the scope of his work. Some 30 years later, Hick’s law helped forge engineering models for human–computer interaction (Card et al., 1983). It was also able to characterise the choice component in the context of computer menus with different numbers of alternatives (Landauer & Nachbar, 1986). It has served well as a stimulus for further theoretical refinement across at least five decades. Broadbent (1958) and Baddeley (1986), among many others, make reference to Hick’s work when formulating their more advanced theories of information flow among components mental architecture. Likewise, current generations of neural network models have replaced speculation with detailed implementations of mechanisms (e.g. see Mcmillen & Holmes, 2006). Choice is pervasive, and anyone concerned with modelling mechanisms still needs to know about Hick’s work. In the postwar period Conrad researched a wide range of problems inspired by thinking about textile mills, our post and telecommunication systems. Across these contexts, listening to verbal material against a noisy background and holding such material in immediate memory were both important applied problems. Successive generations of memory theorists (be they concerned with the short, long or working varieties) have built upon a seminal study by Conrad (1964). He first examined serial recall for visually presented letters of the alphabet. He focused his analysis on the substitution errors in written recall with a sample of 387 trainee telephonists. Errors were relatively high within groups of letters that resembled each other acoustically (BCPTV and FMNSX) and relatively low between these groups. In a separate test, 300 Post Office employees simply listened to and reported individual letters presented in white noise. Letters that were confused in recall were also confused in the listening test. What Conrad recognised was the importance of qualitative attributes of information as well as the quantitative ones that information theory emphasised. Conrad’s initial insight was extended in Baddeley’s later work (1966) on acoustic and semantic confusions in short- and long-term recall. Subsequently, the idea of speech-based coding underlying short-term resource use created a platform for numerous theoretical and practical advances in neuropsychology, for our understanding of healthy and delayed vocabulary acquisition and reading and, of course, the wider cognitive challenges faced by the deaf (Figure 3). Conrad was amongst the earliest to note that errors and malfunctions were vital to developing an understanding the structure of mental and neural systems. His paper is still widely cited over the last decade. In the early 1960s few would have predicted that a collaborative project with the Post Office would have had such diverse and long-lasting effects on psychological thinking. the other self-help oriented) fared in the bestseller’ lists. The other was the work of Adrian Owen and colleagues (2006) on conscious awareness in patients with a diagnosis of persistent vegetative state – PVS (see also The Psychologist, June 2010). While PVS affects relatively few and major depression affects the lives of many, I chose the PVS study because of how it relates to controversies in experimental psychology that have lasted for more than a century. In the late 19th century, Wundt and others were concerned with developing a methodologically sound science. They opposed the Würzburg school, whose favoured method for understanding thought processes involved introspective reporting of the conscious content of mental images and of so-called ‘imageless thoughts’. Owen and his colleagues, working more than 100 years later, were able to detect systematic differences in brain activation in normal healthy volunteers when asked to perform two different imagery tasks – mentally navigating around their own homes and imagining playing tennis. Systematic differences in reported phenomenological experience could be mapped on to equally systematic differences in indices of neural activity in distinct brain areas. Patients with a diagnosis of PVS appear to be awake but show no overt signs of awareness. In a dramatic demonstration, Owen et al. (2006) gave verbal instructions to one such patient to perform the two imagery tasks while in an fMRI scanner. That patient’s pattern of activation of cortical areas was indistinguishable from that of healthy controls. Hard data indicated that the patient could not only implement the different forms of mental imagery, but also must have understood the spoken instruction, have intentionally cooperated with the experimental request, and have been able to access at least some stored representations pertinent to their own home and to the game of tennis. This particular patient and others examined since then must have been consciously ‘aware’. Of course, findings like these will never stop philosophers and some cognitive theorists questioning whether or not we can conclude that the patient really was conscious in exactly the same way as healthy controls. But hard data of this type are of huge significance in an ethically difficult medical domain. Given this evidence, the external termination of life support without reference to patients’ own responses now ceases to be an option. Rather like the key to Egyptian hieroglyphs provided by the Rosetta stone, the imaging data offer a potential means to calibrate and train other, perhaps simpler, response indices such as EEG that can used in more normal living environments to help such patients communicate their thoughts and wishes, however minimally, on a more routine basis. In 1952 Hick confirmed his hypothesis with a circle of 10 lamps, some relay switches and an incredibly modest number of data points. The graphs and decisions trees in his paper were hand-drawn. Whereas Hick found an enduring and challenging regularity indexed via a quantitative attribute of information, Conrad required far more data from over 600 people to establish a qualitative one. Owen and his colleagues required immensely expensive MRI physics, vast computer power, terabytes of storage, advanced statistical packages and graphics engines to realise images of brain activation (Figure 4). The resultant data offer a complete rethink of what it might mean to index the reportability of thought content and the qualia of consciousness (see Owen & Coleman, 2008). Only the brave (or fools) would try to predict exactly what might follow on in future decades from the discovery of new regularities in behavioural and in imaging data. Finding out will no doubt prove to be very expensive. But the very presence of a blend of basic and applied challenges almost certainly means that it will be both exciting and revealing. Psychologists are becoming more and more specialised in increasingly localised domains of data collection and theory. Experimental work in psychology all too often finds significance primarily within the confines of self-referring paradigms. Periodically reminding ourselves about how much we have learned from refreshing what we do by looking at how real minds behave in real domains of life can only be a good thing. Broadbent, D.E. (1958). Perception and communication. London: Pergammon Press. Card, S.K., Moran, T.P. & Newell, A. (1983). The psychology of human computer interaction. Hillsdale, NJ: Lawrence Erlbaum. Conrad, R. (1964). Acoustic confusions in immediate memory. British Journal of Psychology, 55, 75–84. Hick, W.E. (1952). On the rate of gain of information. Quarterly Journal of Experimental Psychology, 4, 11–26. Landauer, T.K. & Nachbar, D.W. (1986). Selection from alphabetic and numeric menu trees using a touch screen: Breadth, depth, and width. ACM SIGCHI Bulletin, 16, 73–78. Mcmillen, T. & Holmes, P. (2006). The dynamics of choice among multiple alternatives. Journal of Mathematical Psychology, 50, 30–57. Mackworth, N.H. & Bartlett, F.C. (1950). Planned seeing. Air Publications 3139b. London: HMSO. Owen, A.M., Coleman, M.R., Boly, M. et al. (2006). Detecting awareness in the vegetative state. Science, 313(5792), 1402. Owen, A.M. & Coleman, M.R. (2008). Functional neuroimaging of the vegetative state. Nature Reviews Neuroscience, 9, 235–243. Teasdale, J.D., Segal, Z.V., Williams, J.M.G. et al. (2000). Mindfulness-based cognitive therapy for depression: A new approach to relapse prevention. Journal of Consulting and Clinical Psychology, 68, 615–623. Teigen, K.H. (2002). One hundred years of laws in psychology. American Journal of Psychology, 115, 103–118.